Have you wondered what direction the S&P is unfolding into lately? Since the late-March low formed at 2045.50, the index has traded to new record highs but it’s not been a straightforward advance – quite the contrary in fact! ‘Volatility’ seems to be a more accurate description of its upward progress as each advance is followed by vicious pullbacks – these are so sharp and deep that you wonder whether a new downtrend is about to kick-in? If you’ve been trading the short side of the market during this time, you’ve most likely jumped in and out several times to the point of exhaustion, exasperation%#! But wait!…in these seemingly chaotic price moves lies perfect geometric symmetry. Using a combination of Elliott Wave pattern identification and Fibonacci-Price-Ratio matrices we’ve unravelled the intricacies of each wave sequence since the advance began and moulded them into a clear and concise forecast of ongoing price development! No more guessing – this forecast is a ‘must-see’. It’s a ‘must-see’ because it probably comes at one of the most important junctures in financial history. Witnessing this next sequence of the stock market is akin to ‘being there’ when it happened, and you’ll be telling the story to your friends for a long time to come. These recent movements of the S&P are not only completing the final Elliott Wave patterns from the March lows, not even the five wave impulse sequences from the Oct.’14 lows, but larger, three wave patterns from the March ’09 lows. That makes it special. If you want to see how each of these ‘three’ time-series are threaded together, then log-in immediately to your EW-Compass subscription and view our latest ‘Week Ahead’ video. 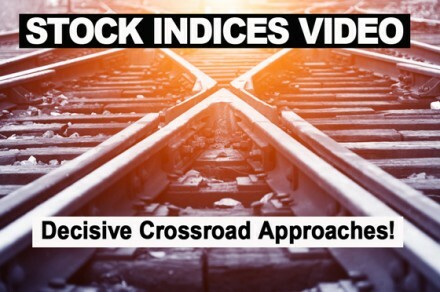 In there, you’ll be able to watch Peter Goodburn’s latest take of the S&P’s recent activity, how it is likely to progress over the next two/three week period and how it integrates into the larger patterns forming from the Oct.’14 and March ’09 lows. A major turning point is coming up and you really must be prepared. The three time-series of the S&P are supplemented with an updated look at last year’s 91 month (7.58 year) cycle – also, there are updates and commentary for the Dow Jones (DJIA), Nasdaq 100, Eurostoxx 50, Xetra Dax, Shanghai Composite, Nifty 50, Nikkei, ASX 200, US$ index, Euro/US$, Stlg/US$, US$/Yen, US10yr yield, De10yr yield, Gold, Silver, Crude oil and Brent oil. Make sure your subscription is up-to-date – or click here to renew! P.S. the video streams for 25-minutes – enjoy!